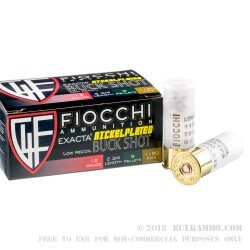 If you buy shotshells by the case, this high-precision 12 gauge shotgun load from Fiocchi’s Exacta line is a great pick. Engineered for reduced recoil, the 9 pellets of 00 buck still achieve a muzzle velocity of 1150 feet per second, giving up less than 200 fps of velocity compared to other shotgun shells. The reduced recoil makes follow-up shots easier and helps preserve the shooter’s shoulder during extended range sessions—a major benefit if you plan to shoot the whole case in one go. 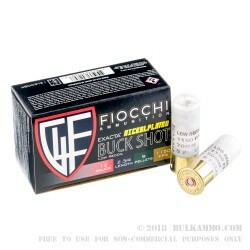 Fiocchi Munizioni shotgun shells, made in Fiocchi’s American facility in Ozark, Missouri, are a popular choice for tactical, sporting, and range use. Although Fiocchi has only been in the US market for about 30 years, the company actually dates back to the 1870s when it was founded by the Fiocchi family, who continue to own and manage the firm today. Fiocchi’s global headquarters and European manufacturing operations are located in Lecco, Italy. Performs the way I want, at a great price. While I've owned many rifles and handguns over the years, for some reason I never had a shotgun until now. I bought a Mossberg 590A1 for self defense and the coming Zombie Apocalypse. When I bought the shotgun, the store owner gave me a verity of partially full shell boxes to try out different loads which did not include any low recoil loads. I decided to try some of these Fiocchi loads after reading the reviews and because the price was right. I'm going to stick with these Fiocchi loads now and in the future. 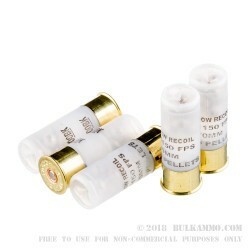 These low recoil loads are MUCH more comfortable to shoot and I'm sure they pack enough power to get the job done, defensively. They gave me a 3" spread at 15 feet, 7" at 30 feet and 17" at 75 feet. Went bang. I believe that's what counts. Fairly tight groups without a choke. Left a little bit of residue on the inside of the barrel, no hang-ups. I was shooting this stuff out of a Mossberg 500 and it worked great. Lot of fun. The only thing I would have ti complain about is that i realized "LE" stands for the low recoil. I could see this being used for home defense, not hunting, but it would be a great load of fun for those who haven't experienced the power of 00 Buckshot, but want to have a little taste. I ordered these on a Sunday night and received them the following Friday morning. Compare that to Cabela's, where I ordered shells and did not receive them for three weeks. I cancelled my order when I called them and found out that I would not receive the shells for another month. The shells are terrific - perfectly reliable in my Mossberg 500 pump (although most shells would be, I suppose). When they say low recoil, they mean it. I fired them intermittently with standard 00 buck, slugs, and even target loads, and the difference from all three was obvious. These would make a fine home defense shell for sure. The shells shipped in 25 boxes of ten, which is great. Easy to move around, pack, and organize. They also fit perfectly into the shipping box, which means no wasted space if you're inclined to leave them in that box and store them. 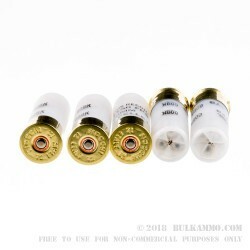 Q: Would you consider 00 Buckshot the best 12ga ammo you sell for home and self defense? A: Both 00 buckshot and slugs are excellent choices for home defense, depending on your individual situation and home layout. Q: Is this ammo available for LE use only or can citizens purchase it? Thanks for your time. A: This ammunition is legal for purchase by non-law enforcement personnel, unless otherwise prohibited by your local laws.